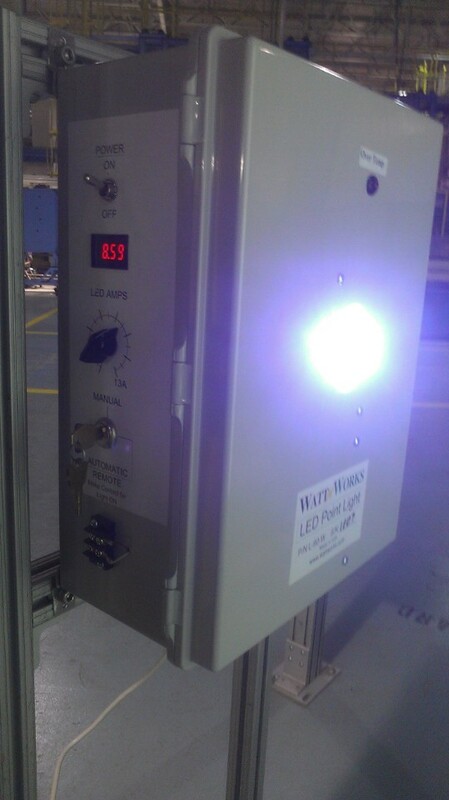 WattWorks, Inc. announces the introduction of the first LED PointLight with brightness sufficient to replace conventional arc lamps currently used for Automotive glass inspection applications, The LED PointLight, designed and manufactured by WattWorks, uses the largest single-chip LED available along with a new proprietary light recycling technology. The WattWorks LED PointLight uses the brightest single-chip LED available. In order to increase brightness while maintaining single-point-source image sharpness, the WattWorks LED PointLight also uses a proprietary spherical reflecting collar with an aperture positioned to be centered over the LED. Light at high angles is reflected within the recycling collar, and reflected again at the LED. The reflected light escapes from the aperture in the recycling collar and increases brightness into the angular distribution defined by the LED with recycling collar. The main benefit of the recycling collar is that the etendue of the LED is not increased so the image remains sharp, while the luminous flux is increased for a brighter image.